The United States Congress designated the Cleghorn Lakes Wilderness (map) in 1994 and it now has a total of 39,167 acres. All of this wilderness is located in California and is managed by the Bureau of Land Management. The Cleghorns are dry lakes plunked near the middle of Cleghorn Lakes Wilderness, an area of remarkably different resources. The eastern portion rises into the rugged Bullion Mountains, while the western section stretches out into a vast alluvial desert slope, or bajada. Elevations range from more than 4,100 feet across the four-mile reach of the mountains to 1,400 feet on the desert floor. Bighorn sheep roam the mountains, and the desert tortoise prowls the lowlands. Some of the washes are adorned with gardens of barrel cactuses and smoke trees (almost leafless trees with gray twigs that appear surrounded by a smoky haze from a distance). The lakes will occasionally erupt into spring wildflower bloom. 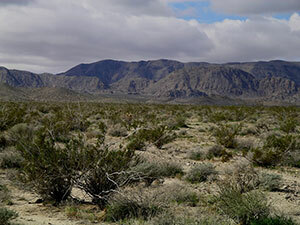 A non-Wilderness road corridor splits off the northwest corner of the Wilderness and leads to the Twentynine Palms Marine Corps Base. You'll find no trails, but old tracks lead into the area. Planning to Visit the Cleghorn Lakes Wilderness? How to follow the seven standard Leave No Trace principles differs in different parts of the country (desert vs. Rocky Mountains). Click on any of the principles listed below to learn more about how they apply in the Cleghorn Lakes Wilderness.